The S238 was introduced in 2016 and led the Supreme line to be the fastest growing towboat in the world. The S238 by Correct Craft is a 23-foot 8-inch wakesurfing and wakeboarding machine with all the power, performance and quality you need to elevate your time on the water. The S238 is equipped with the new Torque Optimized L96 motor from PCM that is more efficient and produces significantly more power than it’s predecessors. Grab your shorts and let’s go take a surf set behind the S238! The Deep-v Hull is the foundation of the superior rough water ride by cutting through the chop with its acutely angled keel. With the perfect placement of the new large SmoothTrack Tracking Fin, the S238 stays straight even with a progressively cutting rider in tow. The 52 square inches of fin surface area also act as an amazing pivot point under the S238, significantly improving slow and high speed handling as well as navigating in reverse. Powered by the all new L96 Engine from PCM, the S238 comes with the new torque optimized 1.72 X 1 gear reduction for instantaneous take-offs and incredible handling even when fully weighted. With 5 years of warranty these engines provide as much piece of mind as they do mind-blowing performance. You will be proud to be seen in this Supreme. The modified V-bow is wide, deep and welcoming, yet follows a traditional style. Supreme’s new Octo Tower with patent-pending overlock adds to the style of the S238 with its aggressive sweeping lines. The tower also introduces finishing that matches elements on the interior and exterior, improving on already stunning aesthetics. From the dock, it is easy to notice the intricate gel coat pattern and stylized graphics. The interior has been upgraded with an abundance of available colored and textured vinyl accents throughout. Inside, the 238 comes standard with Friction Snap-Out flooring that is comfy and functional. The Supreme S238 is designed around functional simplicity. 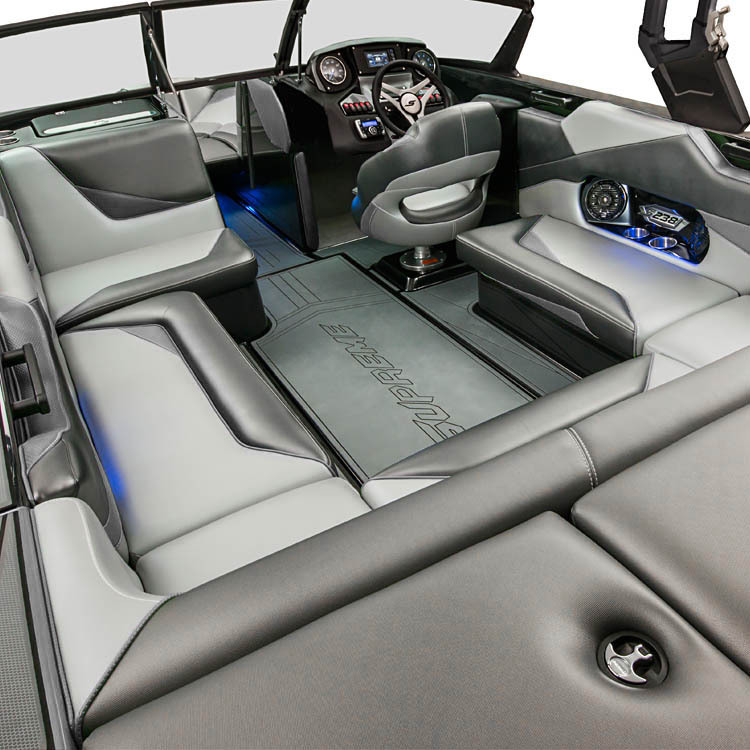 The new SeeTouch Touchscreen Controls give you full access to every aspect of the boat. Between the sure grip of the Gussie Italia Steering Wheel and the familiar feel of the throttle, the S238 is easy and comfortable to operate. There is no learning curve here, and no needless complexity to prevent you from a full day on the water. The Supreme S238 benefits from high quality materials and production processes. 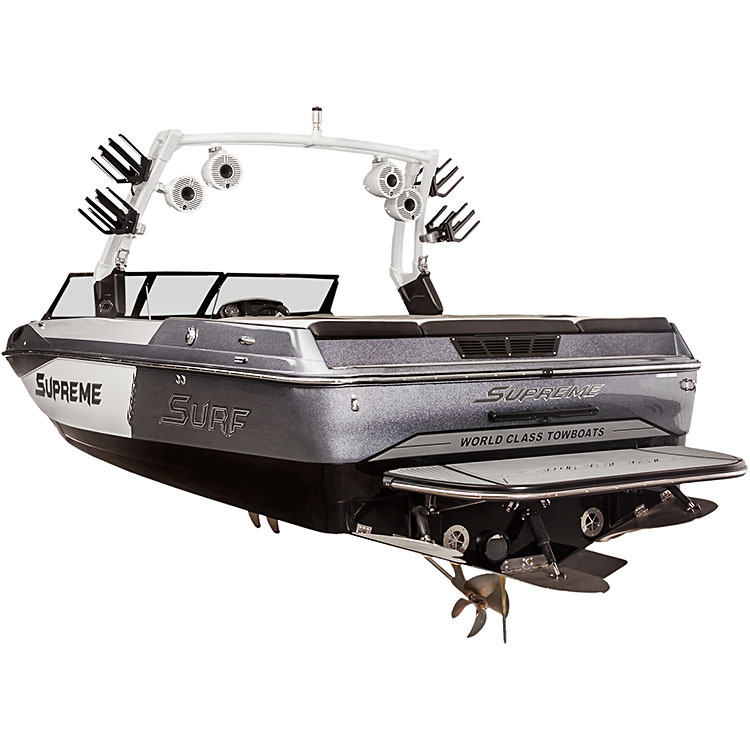 Every Supreme boat comes with a tandem axle BoatMate Trailer equipped with disc brakes on both axles, aluminum wheels, LED lighting, swing tongue, stainless retractable transom straps, aluminum fender steps, winch and strap. The interior is covered in tough, beautiful Spradling Marine Vinyl and sewn with incredibly strong GORE-TEX thread. The S238 interior is seamed with a combination of triple and double stitches that add to cool look of the interior while increasing the strength and longevity. 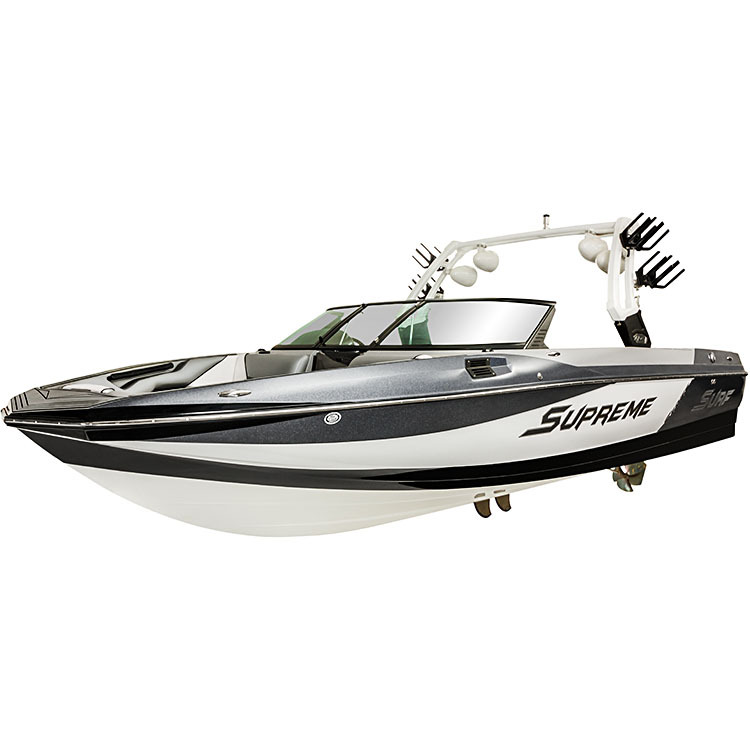 The S238 is equipped with Supreme Sound Suppression Technology material laminated into the hull of the boat. This technology silences prop thrust vibration and water noise for a comfortable, quiet ride. The S238 offers smooth lines and endless gelcoat graphic options. Heads will turn whether you choose a simple classic look or push the boundaries with a bold in-your-face design. There is nothing second rate when it comes to the aggressive lines and sharp accents on this luxurious flagship. The modified traditional bow on the S238 creates a large lounge area where 3 or more people can sprawl out and catch some rays. The unique shape of the bow offers the same space as a picklefork bow shape but with a sleek single point front that can be lined with GatorStep traction. The running surface of the S238 is a true masterpiece. 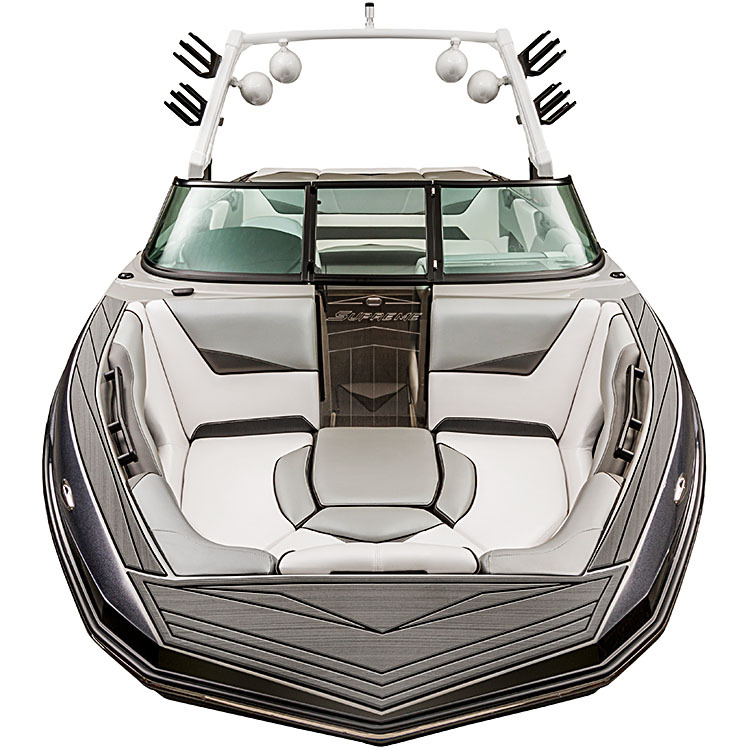 Incredible wakeboard wakes, the ability to flatten out a sweet ski wake and a ride smoother than almost any other towboat are great extras on the best wakesurf hull design offered on any boat in it’s class. 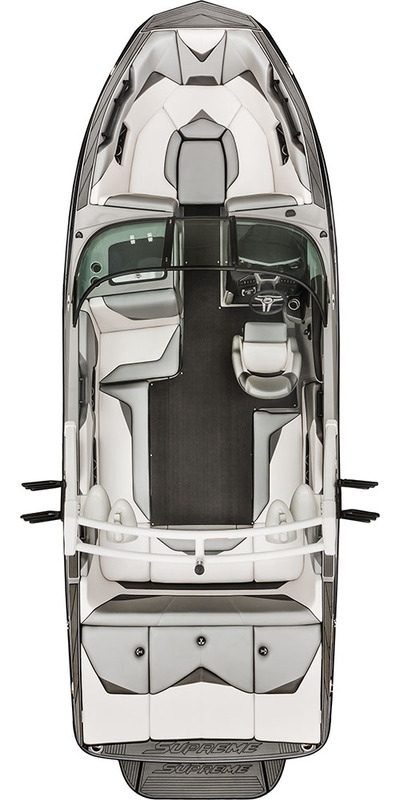 The Surftech V hull offered on the S238 is the main reason it was rated the #1 value class boat at the Utah Surfest. All new for 2017 is the SeeTouch Dash System – offering complete control over everything from your instrumentation, GPS speed control, ballast levels and more. This beautiful full color screen comes standard and features simple menu navigation and vivid touchscreen controls that are easy to see even in bright sunlight. The S238 features a deep cockpit with premium vinyl and finishing throughout. Each boat is built to the lofty Correct Craft standard without cutting corners to reduce the price tag. Climb inside a Supreme and the value is easy to identify. The S238 is outfitted with Wetsounds premium stereo components – delivering crisp audio quality throughout the boat and to the rider with matching tower speakers. The stereo is Bluetooth audio powered, letting you control the beats from anywhere in the boat with ease. The all new Octo Tower on the S238 truly something to behold. Bulletproof construction with the ability to carry up to 10 boards while pumping out killer tunes, the Octo Tower is a perfect representation of affordable luxury. This gem features the ability to quickly collapse with weight assist making garage storage simple.